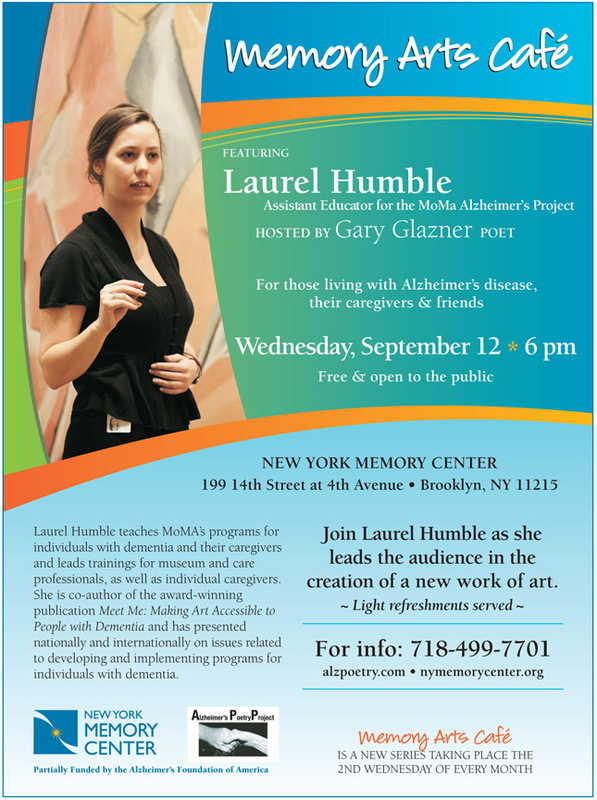 Alzheimer's patients and their caregivers will author a poem with help from Laurel Humble from the Museum of Modern Art's Alzheimer's Project. The New York Memory Center offers its own brand of Memory Cafe each month -- the Memory Arts Cafe. The Memory Arts Cafe was launched and is hosted by the New York Memory Center and Gary Glazner of the Alzheimer’s Poetry Project. This month -- Poetry Writing (see the article below). Christopher Nadeau, a good friend of mine and Executive Director at the New York Memory Center, is committed to the idea that dementia patients can and will benefit from exposure to the arts. In fact, he is a man on a mission. He fully intends to bring this issue into the awareness of our politicians in Washington this month. Christopher not only believes in the use of the arts in dementia care, he has the statistics to back up his words. The New York Memory Center has a well thought out adult day care program that is designed to bring out the "more there" in patients who are becoming deeply forgetful. If you want to learn more about the New York Memory Center, their activities, volunteer, or donate you can reach Christopher Nadeau at 718-499-7701. You can also reach the Alzheimer's Poetry project at through this number. The New York Memory Center is hosting a free event where people with Alzheimer's and their caregivers will author a poem with help from a visiting educator with the Museum of Modern Art's Alzheimer's Poetry Project. The session is the latest installment in a series called the Memory Arts Cafe, a monthly get-together where people with memory loss work with visiting artists to explore their creative side. Music, dancing and visual arts may not sound like medical intervention, but research shows that the arts improves the health of Alzheimer's patients, said Christopher Nadeau, executive director of the New York Memory Center at 199 14th St. between Fourth and Fifth avenues. "Folks have always thought of the arts as cutesy and fun, but it has practical benefits that we're just beginning to realize," Nadeau said. "This is healthcare, we've just never thought of it that way before." One recent study conducted at a nursing home showed that dementia patients who participate in creative activity are less likely to suffer falls, experience less depression and higher self-esteem, and need less direct care from nurses, Nadeau said. The New York Memory Center, a nonprofit center where Alzheimer's patients spend the day, has four artists in residence — a poet, a multimedia artist, a percussionist and a music therapist — who make the arts a part of clients' daily routine. Nadeau says having Alzheimer's patients work on creative projects destigmatizes a disease that many consider a life-ending diagnosis. "There is life after diagnosis and there is a life worth living that can be rich and rewarding," Nadeau said. "(The arts) really invigorates folks in a way that respects and honors the person for their uniqueness. It creates a level of cohesion and empowerment and energy that you just can't explain." The poetry event at the New York Memory is at 6 p.m. Wednesday, Sept. 12 at 199 14th St. For more information call the center at (718) 499-7701.